Davis is a scholar not only of park roads, but of park making in the modern historical era. His previous publications include studies of national and memorial parkways in the United States, pre-automotive park roads and early tourism, and the development of the parks and parkways of Washington, DC. He was the principal editor of a volume documenting the design and construction of national park roads and parkways, published by the National Parks Service and the Johns Hopkins University Press in 2004. Now Davis, the senior historian for the National Park Service’s Historic Structures and Cultural Landscapes Program, has exploited his unique background to assemble an authoritative and comprehensive historical account of this great legacy of designed landscapes in North America for the general reader. The present book is devoted primarily to the park roads and parkways designed and built by the National Park Service between its establishment in 1916 and the 1960s. The irony of the book's epigraph is that this legacy has never been fully appreciated. In the post-World War II era, critics concerned over the impact of automotive tourism successfully intervened to curtail national-park road construction. After John F. Kennedy was elected in 1960, a new generation of officials at the Department of the Interior (the administrative home of the National Park Service) endorsed these attitudes and implemented revised policies that continue to inform many of the priorities and programs of the park service today. Early environmentalists, such as Bradley and his Sierra Club ally David Brower, wanted to protect the nation’s remaining wilderness areas; these were defined primarily as being roadless. The 1964 Wilderness Act enshrined this definition and established a national system of federally designated wilderness areas in which all development, especially road construction, would be prohibited. Eventually, the often spectacular and usually environmentally sensitive roads already built in the national parks would come to be appreciated as great works of landscape design and civil engineering; but this appreciation has been slow to mature. 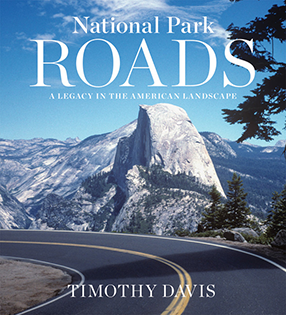 Davis’s book is the culmination of decades of changing attitudes towards the roads that shape the experience of national-park landscapes for many millions of visitors each year. He presents these arteries not as necessary evils but as often deeply moving experiences that, for most, shape and enable the greater part of their visit. The roads, in other words, did not compromise the park service’s 1916 mandate to “to conserve the scenery and the natural and historic objects and the wild life” of protected areas, but rather made it possible for the public to enjoy them “in such manner and by such means as [would] leave them unimpaired for the enjoyment of future generations.” The roads, in fact, through the quality of their planning and design, were primary agents of that mandate’s realization. As Davis eloquently demonstrates, national park roads built a constituency—a public of middle-class automotive tourists—that formed a political base for the funding and expansion of a national park system that continues to be the most powerful influence for its preservation. The challenge for the park service was to assure that roads were built in a manner that maximized the appreciation of dramatic scenery while minimizing the inevitable (but hopefully limited) impacts of construction. The first director of the park service, Stephen T. Mather, prioritized the role of his agency’s landscape architects in road design and initiated a partnership with the Bureau of Public Roads (later the Federal Highway Administration) to assure that landscape architects and civil engineers cooperated on locations and standards for the roads that addressed their privileged context and special purpose. National Park Roads provides a thorough historical overview and analysis of the results. Davis begins in the eighteenth century—well before the foundation of the America's national parks. His book is as much a study of mobility in the landscape as it is of the park roads themselves. Early park designers equipped the landscape parks of Britain and Europe with carriage drives that became the principal means through which visitors appreciated landscape compositions and effects. As private parks transitioned to public places, the planned vistas were enjoyed by larger, if still select, audiences. As Davis notes, Hyde Park had already become a “rendezvous for London’s elite” by the early seventeenth century. The natural style of landscape gardening of the eighteenth century, which was predicated on a new appreciation of scenery within and outside of parks, was facilitated by advances in road engineering and carriage design that made such scenery accessible. These advances implied a mode of experience—the viewer in motion—that would characterize the modern experience of landscape and become the basis of modern tourism. Before 1916 entrepreneurs built roads at Yosemite and Mount Rainier, and the Army Corps of Engineers completed the Yellowstone Grand Loop, which in modified form is still driven today. But the proliferation of automobiles in the twentieth century precipitated a crisis in the national parks as tens of thousands of newly mobile tourists descended on favorite destinations. Park advocates succeeded in establishing the National Park Service as a means to improve management and impose a consistent set of policies on the diverse range of places that Congress had already designated as national parks and monuments. Once the new agency started to receive significant funding in the early 1920s, its challenge was to assure that park development—above all new or improved automotive roads—would be carried out in a way that would fulfill and not betray its mandate to leave parks “unimpaired” for future generations. The result was what Davis and others have described as a “golden age” of park road construction. The moderate driving speeds of the pre-World War II era, combined with productive collaboration between landscape architects and civil engineers at the park service, produced some of the finest park roads ever built anywhere, including Glacier’s Going-to-the-Sun Road, Trail Ridge Road in Rocky Mountain National Park, and the Zion-Mount Carmel Highway in Zion National Park, among many other extraordinary examples. By the end of the twenties, the experience of these roads and the scenery around them cemented the national park in the American popular imagination. The construction of the roads was a complex and unprecedented federal endeavor, and Davis provides the most complete and thoughtful history of it to be published to date. The book is lavishly illustrated, and Davis communicates the political and engineering details gracefully, without becoming obscure or resorting to jargon. He does not neglect to provide full explications of the controversies that accompanied road building in national parks. Early environmentalists welcomed increased budgets for parks and, at least initially, the increased access road improvements made possible. From the earliest days, however, they also expressed their concern that the automotive public could be not only a force for preservation but also the greatest single threat to the places conservationists loved. Franklin Roosevelt’s New Deal provided funding and labor for the expansion and development of the national park system, including the building or completion of many of the nation’s most dramatic park roads. Then, after the enforced hiatus of World War II, Congress appropriated one billion dollars for park system expansion and modernization between 1956 and 1966, the fiftieth anniversary of the National Park Service. The initiative was named Mission 66 by then park service director Conrad L. Wirth. It produced the national park system we know today in terms of visitor centers, utilities, road modernizations, camp grounds, and innumerable other aspects of national park infrastructure. However, Wirth was forced into retirement in 1964, as conservationists, who had increasing political power, pushed back against what they perceived as the overdevelopment of the parks. Under John F. Kennedy’s Secretary of the Interior, Stewart Udall—during an era of environmental legislation and increased concerns over the impacts of soaring national park visitation—the direction and policies governing the national park system would permanently change. There is much more to National Park Roads than the discussion of these shifting policies. For example, Davis includes a history of national parkways, including the Blue Ridge Parkway, and discusses unrealized parkway proposals, such as the Green Mountain Parkway. He also provides a balanced assessment of the benefits of national park roads versus the disadvantages of automotive tourism. Today the national park system is beset, as always, by threats to its integrity. Climate change, habitat fragmentation, and air pollution are issues that the road builders of the 1920s and 1930s rarely contended with, and they are regional or global in scope. Perhaps the greatest concern for the future of the system, however, is one that Stephen Mather would have recognized: the need for a continued and full engagement of the public with their national parks. Without a representative and broad constituency, the national parks really would be in trouble. Reaching out to younger and more diverse generations of Americans was identified as a primary goal of the commemorations around the National Park Service’s centennial in 2016. In contrast, building more national park roads would be unlikely to gain the park service broader political influence. But it is worth remembering that is exactly what national park roads accomplished in the first half of the twentieth century.